When we want to make a decision, we need Information. Information consists of hard facts that give us clues to what’s happening. 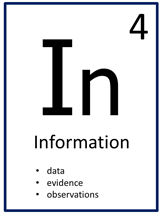 Information can come from data, observations, facts, experiences, statements, statistics, diagrams, anything that is concrete and can be verified. To be useful, Information has to be reliable; it must reflect reality and be free of bias, especially your own. Assess where the information is coming from, who says it, if they are competent, trustworthy, and fair-minded. We build our thinking on Information that is strong and logical. Be sure to only claim as true what you have information to support. And if you really want to make your argument strong, look for Information that opposes your claim, so that you are forced to rethink your reasoning. Be systematic about how you collect the Information. Check to see if what you think you know is true, and then see how that leads you to want to know other information. Also, be constantly checking the other Elements for information that you need to explore them deeply. Next, organize the Information so that it makes sense to you. Find patterns that give you the insights to fill out other parts of the wheel. As more information is found, see how that information affects the logic of what you’re looking at. Finally, keep looking until you feel your Information is complete. Check if there are more observations or evidence you could collect that would help you think deeper. Information is the foundation upon which we construct our reasoning. It helps us to reverse engineer the logic of what is being examined. Collect the best evidence and make your thinking rock solid.